March « 2014 « Central Australian Art Society Inc. This coming Sunday, 9th March at 2pm, we invite you all to join us at the Art Shed for artists’ talks and the closing of our exhibition: The Collection: Diverse Artworks Celebrating 50 Years of CAAS. We have seven artists confirmed. Please come and listen to them share their art journey and wherever else our informal chat takes us! Above is the work Devil’s Marbles acquired from our 1977 NT Art Award exhibition from founding member Myrtle Noske (nee Johannsen). Myrtle was born in a different era at Deep Well Station in 1926. 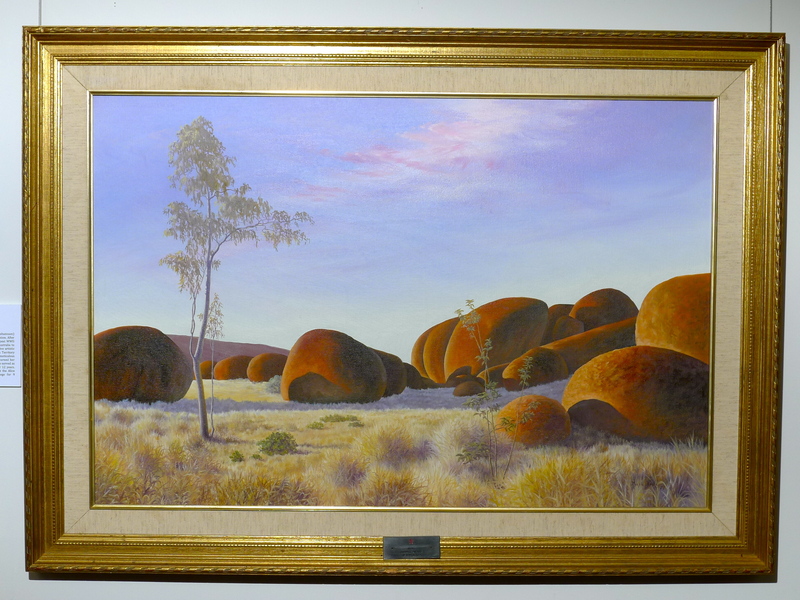 Following art studies in Melbourne post WWII she returned to Central Australia to pursue an extremely active artistic career winning many Territory-wide awards. Her meticulous approach to her subject (evidenced above) earned Myrtle many commissions. Myrtle served as our president for twelve years. She was the art tutor at the Alice Springs Community College (now campus of Darwin University) for nine years. We are proud to have Myrtle as one of our founding members and so happy that she could join us for the exhibition’s Opening last Friday night.